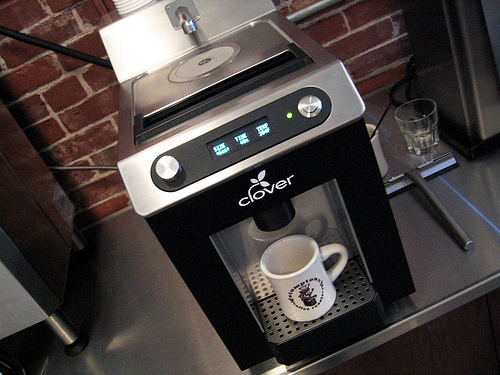 Starbucks has purchased the small company that makes the Clover, a machine that grinds and brews a cup at a time (here’s the NY Times story). Stumptown is going to get rid of their Clovers. “We’ve never purchased parts or service from Starbucks in the past, and we’re not going to start now,” said Matt Lounsbury, Stumptown’s director of operations, who said the company’s two stores with Clovers would stop using them by Friday. It’s hard to explain why without sounding like a fake connoisseur, but I really liked getting a cup brewed at the Annex on Belmont. And it was always fun to get a recommendation from the barista. It’s the closest I’ll ever be to a snob about anything. I’m out of town, so I won’t get to enjoy one last Clover cup before they rip it from the wall on Friday. Some are saying the move is egotistical. I say it’s great to see someone refuse to compromise on their vision. I’ll take a French press of Stumptown over a Clover-brewed cup of Starbucks anyday. Until then, I’m hoping Stumptown will open a secret speakeasy where they put their Clovers to use with their beans. Check out photos of the Clover at the Annex here.